On March 25, 2016, OSHA published the long-awaited respirable crystalline silica rule, which the agency says will affect 2 million construction workers who drill, cut, crush or grind silica-containing materials such as concrete and stone, and 300,000 workers in general industry operations such as brick manufacturing, foundries, and hydraulic fracturing. Sy-Klone International understands that meeting these requirements, so we have put together 3-simple steps to assist your efforts. OSHA Ruling Deadlines: The new rule is effective September 23, 2016. Employers have one year to phase in compliance with parts of the rule. Part 1926.1153 of OSHA crystalline silica rule covers construction. Full employer and product compliance is due September 23, 2017. 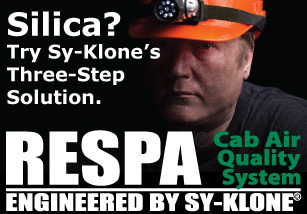 Sy-Klone International offers three easy steps for meeting the Silica Rule Requirement. Step One: Begin with the Fresh Air Component–The RESPA®-CF2. This fresh air system dramatically extends filter life and reduces the frequency of costly HVAC repairs by delivering more than 100 CFM of precleaned and filtered (MERV 16) fresh air to the HVAC system. It accepts MERV16, HEPA, and Odor/HEPA without the need of retrofit kit. Sy-Klone’s Gas/HEPA ABEK1 P3 filter (extended length only) is a RESPA-CF2 exclusive. Step Two: Add a Recirculated Air Component with RESPA®-FFX2 or RESPA®-CFX. 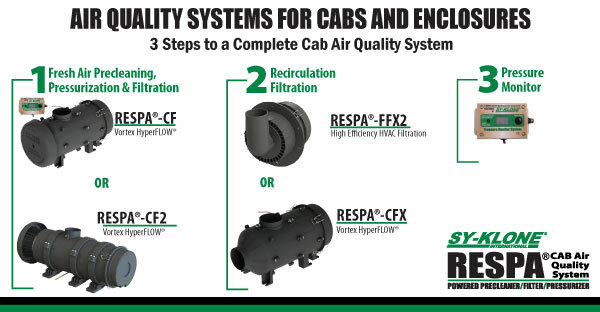 These customizable recirculation filtration options will optimize the cab to protect cab electronics, increase operator protection, and reduce harmful particulate buildup on your expensive HVAC evaporator coils! Step Three: Add Intelligence with the Electronic Pressure Monitor System. This easy to install unit gives you real-time information on cab pressure, when to change filters in your RESPA system, can be connected to remote telemetry systems, and is approved by most regulatory agencies! This is an essential part of the complete RESPA Cab Air Quality System. The installer can customize the unit to display pressure in inches of water column or Pascal, the pressure level at which the unit alerts, and the volume of the audible alarm. It is included with most RESPA-CF Fresh Air systems. You will always know when your cab is positively pressurized, as required by the new OSHA Silica Regulations. Sy-Klone’s patented Air Quality products are economical and cost effective at providing clean air to your HVAC system. Reduce operator exposure to harmful particulate, dramatically extend filter life, and lengthen the life of your HVAC system and cab electronics with our powerful and unique products. Sy-Klone’s Cab Air Quality products have been proven in Mining, Waste, Forestry, and Agriculture, and are available as first-fit options from many original equipment manufacturers. Meets criteria specified by new OSHA Silica Rules, including precleaning, MERV16 filtration, positive pressurization and settled dust removal.